Sigma continues full-steam ahead with its "Global Vision" lens series, with the release of a highly versatile 24-105mm image-stabilized model. 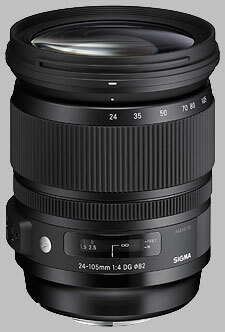 The Sigma 24-105mm ƒ/4 DG OS HSM “A” is a high-performance, full-frame, Art-series lens with a constant ƒ/4 aperture and Optical Stabilizer I.S. system, and competes directly against the Canon 24-105mm ƒ/4L IS and Nikon 24-120mm ƒ/4 VR G lenses. Sigma also plans to release a Sony Alpha version of this lens, though this model will not include OS, as Sony cameras have in-body sensor shift image stabilization. This is a new model for Sigma -- not an update to an older lens -- and joins their already extensive and quite well-regarded lens lineup. If Sigma's previous Global Vision lenses are any indication, this versatile, stabilized zoom lens is sure to be another great choice for users looking for an alternative to the major camera manufacturers' offerings. The Sigma 24-105mm ƒ/4 DG OS HSM “A” is currently available in Canon-mount for $899 and ships with a bayonet-style, petal-shaped lens hood, front and rear caps and a soft case. The Nikon-, Sony Alpha- and Sigma-mount versions are currently available for pre-order (as of this publishing date) at the same price. Overall, the Sigma 24-105mm is a very sharp lens, particularly in the center. On our full-frame camera, we saw excellent center sharpness wide open, throughout the zoom range. At the shorter focal lengths, there's some corner softness at the wider apertures, but stopping down helps sharpen things up a bit. Most apertures produce sharp images, and it's only at the smallest of apertures (ƒ/16-ƒ/22) that diffraction-limiting softness begins to affect image quality, most notably at 24mm and 105mm. Since this lens is designed for a full-frame camera, when mounted to an APS-C camera, the image circle is cropped, and as such, this already-sharp lens shows impressive sharpness across the entire frame on smaller-sensor bodies. Our blur chart shows almost-flat, corner-to-corner sharpness, even wide open at all focal lengths on our Canon 7D test body. Like we saw with the full-frame body, there's some diffraction-limiting softness at ƒ/22, but overall it's a very minor effect on a sub-frame camera. The Sigma 24-105 does quite well in controlling chromatic aberration overall. On both the full-frame and sub-frame bodies, we saw a little more CA at the shortest and longest focal lengths, while it drops significantly towards the middle of the focal length range. It's almost like an upside-down bell curve with the extreme ends showing a bit more CA -- but still not a significant amount -- and a center valley of very low CA. The Sigma 24-105mm lens shows pretty strong vignetting at 24mm on a full-frame camera with over 1.25 stops of light falloff at ƒ/4, but then decreases steadily to a little over 0.5 stops at ƒ/8 and hovers around there for the rest of the apertures. Interestingly, there's no trend or pattern of decreasing vignetting as you zoom out to the longer focal lengths. For instance, at 35mm ƒ/4, we saw just under 0.75 EV of light falloff, but then 68-80mm ƒ/4 actually shows a bit more vignetting, with over 1 stop of light falloff. Nevertheless, vignetting is quite visible wide open at all focal lengths, and then decreases steadily to ƒ/8 and holds pretty steady at under 0.5 stops of the light loss in the corners throughout the rest of the apertures. On a sub-frame camera, thanks to only using the central portion of the lens's full-frame image circle, vignetting is practically nonexistent for all focal lengths and all apertures (all show less than a maximum of 0.25-EV of light falloff). On average, the Sigma 24-105 shows some barrel distortion at around +0.5% at 24mm, shows less at 35mm and then increases a bit more once it's zoomed to 51mm and beyond. In the corners and edges of the frame, it's a bit more interesting, however. At 24mm, the periphery shows right around +1% barrel distortion, but by the time you zoom to 35mm and beyond, you see between -0.5% to -1% pincushion distortion. We saw a similar pattern with this lens on a sub-frame camera, but with a much less pronounced effect. The Hyper Sonic Motor electrical focusing system of the Sigma 24-105mm allows it to autofocus very quickly, silently and accurately. It took about one second to rack focus from minimum focusing distance to infinity. We found no issues with locking onto targets -- no hunting around to achieve focus. Also, small changes to focus happen very quickly. The front element does not rotate when focusing nor does it extend -- this is an internally-focusing lens. The manual focusing behavior with this lens is also pretty standard fare for a DSLR lens with a physical AF/MF switch on the side to disengage AF operation and a focus distance scale (but no depth of field indicators). The focus ring rotates smoothly with soft stops at either end of the focusing range. Since the lens uses Sigma's Hyper Sonic Motor focusing system, users also have full-time manual focus override even while AF is enabled. This lens isn’t specifically built for macro shooting with a maximum magnification ratio of 0.22x (1:4.6) and a minimum close-focusing distance of around 45cm (17.7 in.). Like Sigma's other recent Global Vision lenses, the new 24-105mm ƒ/4 DG OS HSM “A” has a barrel constructed from their proprietary Thermally Stable Composite (TSC) material. which feels just like metal, but is actually a type of polycarbonate with similar thermal properties to aluminum. Unsurprisingly, the build quality of this lens is excellent, but at the cost of being quite large and heavy at 885 grams, which we didn't expect. While it's not as heavy as the Canon 24-70 ƒ/2.8L Version 1 lens, it is heavier than the Mark II version. Compared to the Canon 24-105mm ƒ/4L IS, this Sigma model feels significantly heavier, larger and bulkier. Our full-frame test camera for Canon lenses is the 1Ds Mark III, which is far from a lightweight camera on its own. With the Sigma 24-105mm lens mounted to that body, it's a heavy combo. Even on a smaller camera body, it makes for a fairly hefty camera and lens pairing. On the outside, both the zoom and focus rings are covered in a thick rubberized bands for a secure grip, and rotate very smoothly. It does take a bit of effort to rotate the rings, particularly the focus ring, which has a smooth but firm rotating action. The zoom ring is also quite firm and takes some "oomph" to rotate, but will stay put -- no risk of lens creep here. 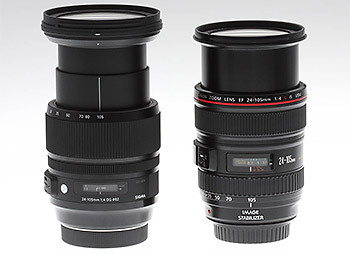 Unlike the Canon 24-105 lens, for example, the Sigma's zooming barrel is a two-part telescoping design, as opposed to the Canon's single-barrel extension. Nevertheless, the Sigma's internal barrel feels very sturdy with no wiggling or play when extended. The internal barrels feel more like traditional polycarbonate unlike the TSC material of the exterior barrel (although Sigma didn't provide a spec for this). Other exterior features include two switches on the side of the barrel -- one for autofocus/manual focus mode and another for OS on/off. The manual for the lens says not to use Optical Stabilization when on a tripod or in Bulb mode. There's quite a bit of glass inside the barrel, with 19 elements in 14 groups including 3 aspherical elements and a pair each of FLD glass and SLD glass elements. The front element is quite large, with 82mm filter threads, which is a bit of a downside, as 82mm filters are less common and filters of this size are typically much more expensive than their 72mm and 77mm companions. The aperture diaphragm is a 9-bladed circular design for pleasing, smooth background blur. Like Sigma's other Global Vision lenses, the 24-105mm lens is compatible with their new USB Dock calibration and updating accessory. For Canon users, the obvious alternative is the ever-popular Canon 24-105mm ƒ/4L IS, which has pretty much exactly the same basic specs, including an identical zoom range and a constant ƒ/4 aperture. It also has built-in image stabilization. The Canon is much smaller and lighter in weight (and uses the more-common 77mm filters), however it's not as sharp as the Sigma and shows a bit more CA. The Canon lens, on the other hand, does do a bit better with vignetting. Also, the other difference is price. With a current street price of $1,149, the Canon is significantly more expensive. However, this lens is also sold as part of Canon 5D Mark III and Canon 6D kits, and many retailers break apart these kits and sell the lens separately separately, often in the $700-900 range. The Nikon alternative is actually a bit more versatile than the Sigma with its longer zoom -- out to 120mm -- all the while keeping the constant ƒ/4 aperture. Like the Sigma, the Nikon also has image stabilization. The Nikon lens is also quite sharp -- a bit better than the Sigma -- and also better at controlling vignetting at 24mm. The Sigma, however, shows better results at controlling CA in most cases, the Nikon beating it slightly at telephoto. Like the Canon, though, the street price of the Nikon lens is also much higher than the Sigma. The Sigma 24-105mm ƒ/4 DG OS HSM “A” is a solid addition to their already-stellar lineup of lenses produced under their new Global Vision design strategy. The Sigma 24-105 is a very versatile lens with a great focal length range, a constant -- yet not super-fast-- ƒ/4 aperture and image stabilization. Optically, the Sigma produced impressive results, with sharp images on both full- and sub-frame lenses. While vignetting was a bit strong in the corners, particularly at the shorter focal lengths on full-frame bodies, chromatic aberration was quite well-controlled. The biggest downside to this lens is its size and weight. 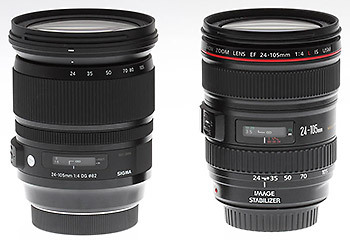 Compared to its Canon and Nikon counterparts, the Sigma 24-105mm is significantly heavier and physically larger. The appeal of it being a one-lens solution with its useful zoom range is lessened by its bulkiness. Tipping the scale at nearly 2 lbs., it's a serious lens, more than a casual user wanting a versatile walk-around zoom might want to carry around over their shoulder all day. Be sure to also check out sample gallery photos shot by Rob Murray, our Lens Specialist, over on our Flickr page. Solid build and a great looking lens. 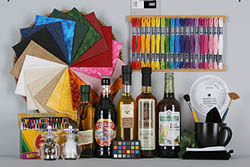 The SLR Gear review is right on. Though this Sigma is large and on the heavy side, for what its giving, I'll gladly haul it around. I first tried the Tamron 24-70, another great performer optically, more expensive, but also rather heavy and more limited zoom range. I like the silent optical stabilizer on the Sigma, and the very quiet, quick focusing. The zoom and focus ring are rather stiff, I like the precision of both though some may not be comfortable with the resistance. I compared the resolution and contrast of this lens against various zooms and primes at similar focal lengths at f/4, f/5.6 and f/8: Nikon 70-200 f4 at 105 mm, a Nikon 85mm 1.8d, Nikon 50mm 1.8g and Tamron 17-50 dx and Tamron 24-70 f2.8 FX. As far as I can tell, the Sigma 24-105 offers very nearly the same or better resolution as any of these lenses. CA is slightly evident at the long zoom end. I rated IQ at 9 due to somewhat soft corners wide open and slight center softness at the long end, both are improved by stopping the lens down. 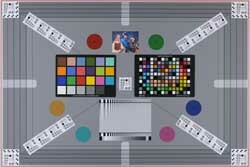 Only compared to the best the other lenses could offer, did I notice any slight deficiency in IQ. This lens is a top performer, hopefully it proves to be reliable as well.